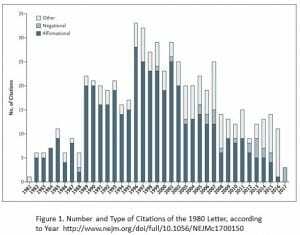 In 1996 with the introduction of OxyContin by Purdue Pharma, the use and abuse of the letter almost tripled. 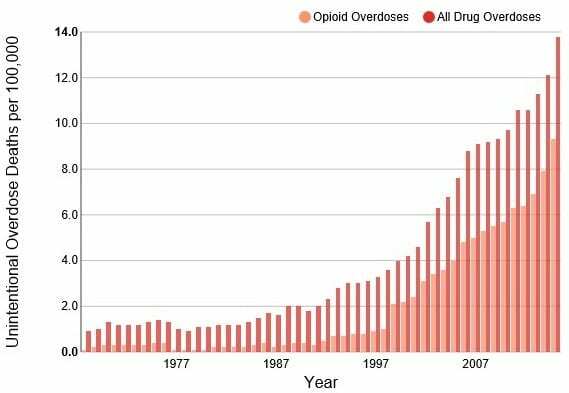 If we go back to the charts again, we can see that upon introduction of OxyContin in 1996 a year or so later the death rate per 100,000 doubles and continues to increase yearly. “The aggressive sales pitch led to a spike in prescriptions for OxyContin of which many were for things not requiring a strong painkiller. In 1998, an OxyContin marketing video called ‘opioids-pain/20180314/opioids-pain" >I got My life Back,’ targeted doctors. In the promotional, a doctor explains opioid painkillers such as OxyContin as being the best pain medicine available, have few if any side effects, and less than 1% of people using them become addicted.” Increases in drug poisoning deaths involving prescription Opioids increases with 37% of all drug-poisoning deaths in 2013 being attributed to Opioids a 4-fold increase from 1999. There are no loud guns shots in the middle of the night. No screams for help or sounds of cars speeding away. No police sirens or flashing lights. It is pretty quiet when someone ODs on Opioids unless someone finds them before it is too late. In comparison, only the NRA and its gun lobbying efforts in legislatures displays a similar capability to oppose and defeat any and all laws for bullet-spewing-weapons laws the same as the Opioid industry efforts to block legislation. Legislators pay attention when either industry or lobby calls on them. 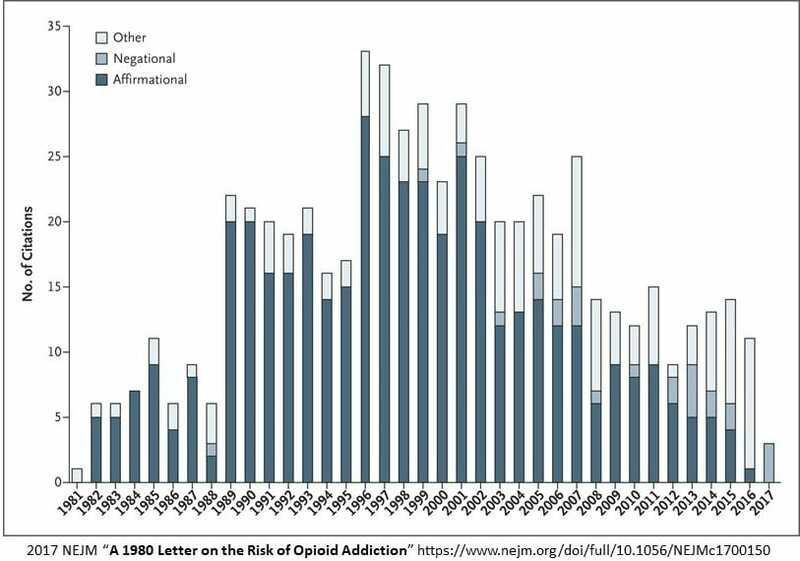 Any particular article advocating greater regulation of Opioids or reporting of Opioid dangers on medical blogs such as Medscape, centers such as opioids-policies">Public Integrity, news agencies such as Associated Press are met with a resistance (if they still have a comments section) the same as what is found on sites when they advocate for greater “gun control.” The evidence is overwhelming that there is an opioid epidemic in the nation resulting from usage and is similar to the epidemic of injury and deaths resulting from guns. Quietly, the industry and their lobbyists work the legislatures to stymie any effort to control opioids. Emergency department (ED) visits for suspected opioid overdoses rose by 30% throughout the U.S. in a year, according to the CDC. 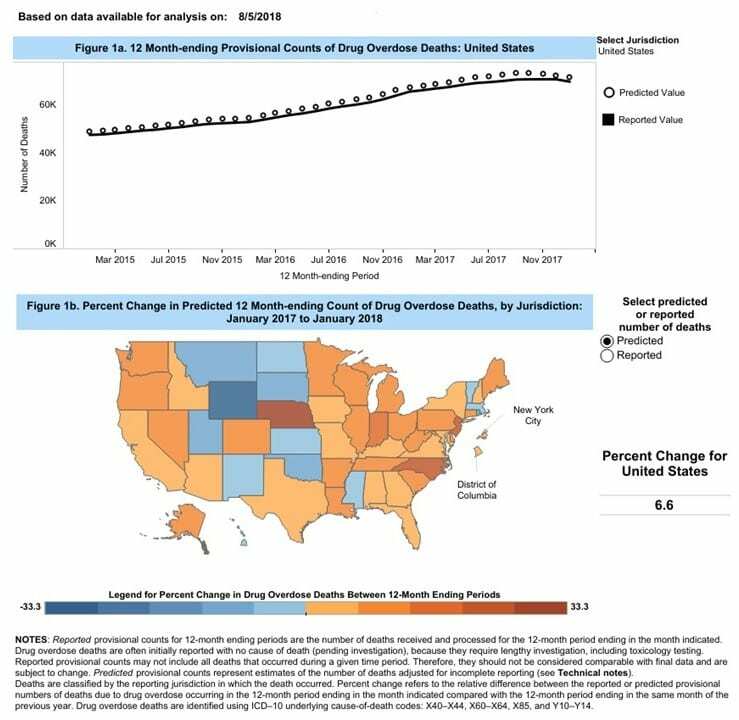 “All five regions of the U.S. saw significant increases during this time period,” said Anne Schuchat, MD, acting CDC director, in a CDC tele-briefing Tuesday. If you come back later to Medscape article, you will see the comments section flooded with what appears to be an organized opposition to what supported facts MedScape presents and consequently any and all suggested Opioid control. Many of the posters appear to be the same ones time and time again. It is pretty apparent the pharma industry is attuned to any medical backed article going up advocating for Opioid control. The analysis backing the increase in Opioid ER visits can be found in a new CDC Vital Signs report. The basis of its findings are from ~91 million ED visits in 52 jurisdictions in 45 states from July 2016 to September 2017. The data is reported in the CDC’s National Syndromic Surveillance Program (NSSP) Biosense Platform. The 142,557 visits to the ER reported as suspected opioid overdose cases equate to a 29.7% increase from the previous 1-year period. Any particular article advocating greater regulation of Opioids or reporting of Opioid dangers on medical blogs such as Medscape, centers such as opioids-policies" >Public Integrity, news agencies such as Associated Press are met with a resistance (if they still have a comments section) the same as what is found on sites when they advocate for greater “gun control.” The evidence is overwhelming that there is an opioid epidemic in the nation resulting from usage and is similar to the epidemic of injury and deaths resulting from guns. Quietly, the industry and their lobbyists work the legislatures to stymie any effort to control opioids. 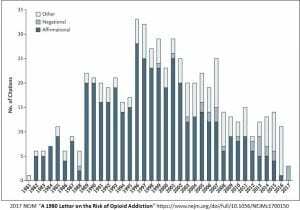 In 1996 with the introduction of OxyContin by Purdue Pharma, the use and abuse of the letter almost tripled. 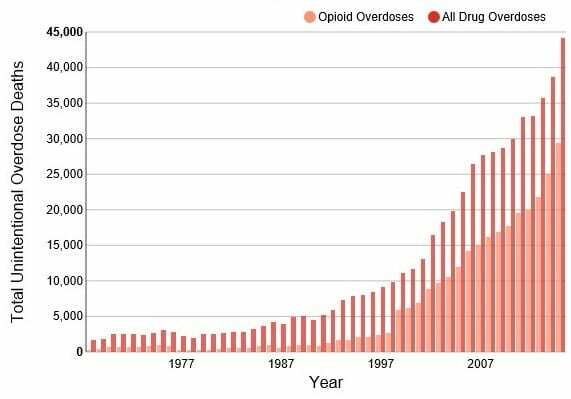 If we go back to the charts again, we can see that upon introduction of OxyContin in 1996 a year or so later the death rate per 100,000 doubles and continues to increase yearly. “The aggressive sales pitch led to a spike in prescriptions for OxyContin of which many were for things not requiring a strong painkiller. In 1998, an OxyContin marketing video called ‘opioids-pain/20180314/opioids-pain" >I got My life Back,’targeted doctors. In the promotional, a doctor explains opioid painkillers such as OxyContin as being the best pain medicine available, have few if any side effects, and less than 1% of people using them become addicted.” Increases in drug poisoning deaths involving prescription Opioids increases with 37% of all drug-poisoning deaths in 2013 being attributed to Opioids a 4-fold increase from 1999. 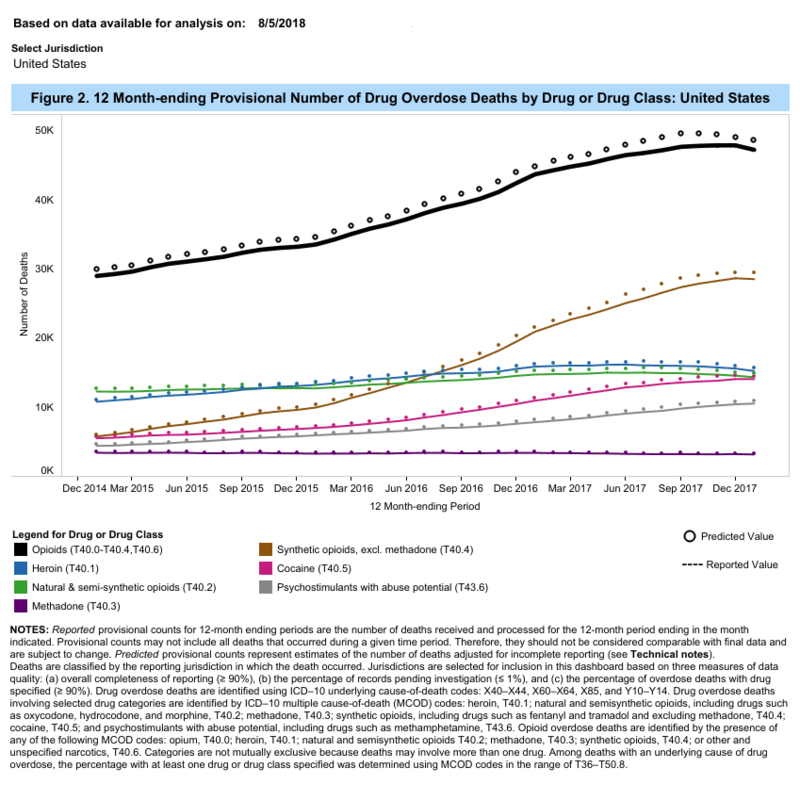 Yes the pharmacist is correct when he says of the 72,000 deaths only 19,354 can be attributed to opioid pain relievers in 2018. Janet cited the 20 years of Vietnam deaths. The pharmacist conveniently sidesteps the time periods involved here. 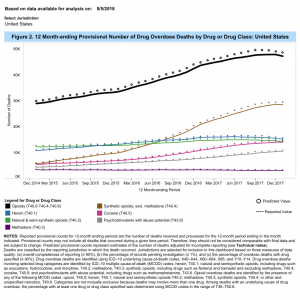 In three years and if the numbers stay the same (they have been increasing YOY), the numbers of opioid deaths will be slightly less than 20 years of Vietnam if it were to remain at 19,000/year. 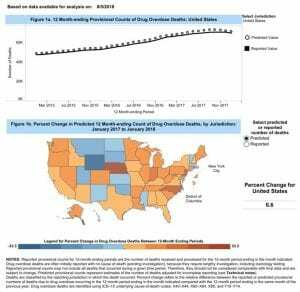 Four in five new heroin users started out misusing prescription painkillers. 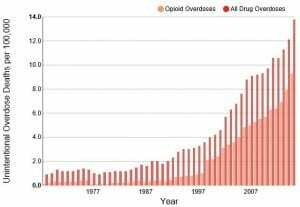 Of recently cited 150,000 accidental deaths, opioids">72,000 (a record high) can be attributed to drug overdose deaths, a record high. The aggressive sales pitch led to a spike in prescriptions for OxyContin of which many were for things not requiring a strong painkiller. In 1998, an OxyContin marketing video called “opioids-pain/20180314/opioids-pain">I Got My Life Back,” targeted doctors. In the promotional, a doctor explains opioid painkillers such as OxyContin as being the best pain medicine available, have few if any side effects, and less than 1% of people using them become addicted. She asserts that the privately held company and 16 of its key directors and executives actively obfuscated the truth about opioid use, downplaying the perils of addiction and overdoses with the aim of getting more people to take them at higher doses for longer periods of time in order to boost the business’s bottom line. “Purdue Pharma created the epidemic and profited from it through a web of illegal deceit,” the lawsuit alleges. While several other state attorneys general have taken similar legal action against Purdue, Healey’s action Tuesday opens a new front in the battle against the scourge of overdoses in Massachusetts. And the suit, filed in Suffolk Superior Court, hints the state could be seeking damages to the tune of billions of dollars. “We found that Purdue misled doctors, patients, and the public about the real risks of their dangerous opioids, including OxyContin,” Healey said at a news conference, standing next to officials including Governor Charlie Baker as well as families who have lost loved ones to overdoses. “Their strategy was simple: The more drugs they sold, the more money they made — and the more people died,” Healey said. An investigation by Healey’s office found that since 2009, 671 people who filled prescriptions for Purdue opioids in Massachusetts subsequently died of an opioid-related overdose, the legal complaint says. 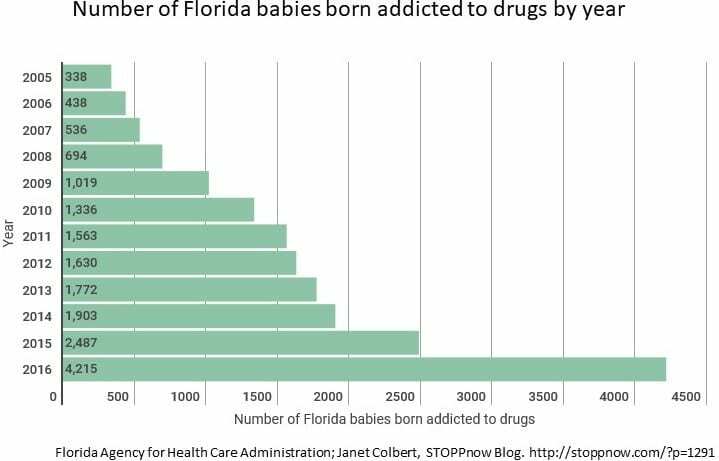 Janet Colbert is a Neonatal Nurse in a Florida hospital caring for newborns who are addicted to opioids at birth. If you recall my way-to-long post: How Pharma Influences . . .
From 2006 to 2015, pharmaceutical companies spent opioids-policies">$880 million in lobbying state and federal legislatures and contributing to campaigns to prevent laws restricting Opioid prescriptions. Their lobbying expenditures has outstripped those advocating for greater controls on prescriptions by 200 times giving them greater influence at the state level. 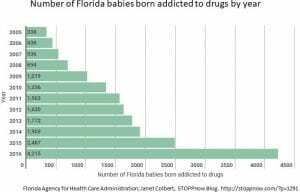 Pharmaceutical companies spend almost twice as much every year as compared to what Florida will spend to fight the Opioid epidemic in Florida over a period of time.